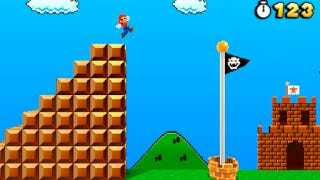 You can jump over the flagpole in Super Mario 3D Land. Nothing special happens. I figured that out this morning, while riding the F train in New York City and balancing myself just right so I could keep playing without falling over my fellow commuters. On that same train ride I learned that I can complete an entire level of Super Mario 3D Land in the two minutes it takes for the local to go from one stop to the next. You'd think these would all be disappointments, but I'm having a great time with the game, so far. 1) The levels are short. I'm in World 3 (of 8) and have only had the game running in my 3DS for a couple of hours, according to my system's activity log. I think that includes about an hour I spent letting the game idle. But I hear this is not a content-light game, so I'm expecting some twist. Extra content. Something. I'll surely figure that out soon! There are four levels in each world, plus a castle or airship boss level. Each brisk levels is the right length for quick-burst portable play. You get from level-start to flagpole in just a couple of minutes, but usually only after having made a bunch of decisions about which coins to grab, which ways to go in the levels, who to fight and who to run away from. 2) The 3D effects are really good. I'm playing the game with my 3D slider at 75%. Sometimes I max it out, and it's still comfortable. The game feels inferior with the 3D off. Mario's world flattens and is less interesting to look at it. It is indeed easier to judge some of his jumps with the 3D on, but it's not guaranteed. If you can't see the 3D, you'll be fine. But I recommend it. (I don't recommend the d-pad-triggered enhanced 3D which does make my eyes bulge. That's too much 3D!). The 3D works very well when you're dropping from an elevated platform or launching to the sky. In both cases, the developer-controlled camera angle switches to an overhead angle, making the 3D depth appear to stretch very far down. It's impressive. 3) Retro Super Mario references are abundant. In just the first 13 or so levels that I've played, I've run over those donut-bridges that fall after you stand on them. I've found little light blue dragon guys that remind me of these guys. I've worn the Tanooki tail, which I appreciate even though it's just a stand-in for a Yoshi flutter-jump in this game (plus offers a horizontal melee attack). I've even played on a level shaped like a Super Mario sprite from the original Super Mario Bros. and found the Luigi sprite hiding on the level. 4) These levels are stuffed with secrets. I've yet to play through a level that didn't seem to be bulging with optional nooks to explore. Some diversions are tiny. Some appear to branch half of the length of the level. The game wordlessly invites players to tinker, so that's what I'm doing. If I see an unlit torch, I find a Fire Flower and hit the torch with a fireball. If I see a space near the edge of a wall, I try to run behind that wall. If I see a bush, I burn it and, what do you know, there's an enemy under there ready to fart out some coins. I've yet to find something in the game that I can poke at without activating some little pleasure. 5) So far, free lives are easy to get. I have 37 and I haven't even been trying. 6) The 3D Land Street Pass system seems silly. There are things called Mystery Boxes which are cube-shaped rooms that have some enemies in them. You access them from the game's level menu and put the level into a dormant stage when you finish it. The levels last about 15 seconds. The idea is that you allow your game to wirelessly communicate with others' via the 3DS Street Pass system. If you do this, even if you don't have the game in there, you'll find that one Mystery Box becomes active again. The game's digital instruction manual claims this box will be one that the other player has completed and adds that, as a bonus, the box will contain a special coin in it. Those special coins, which can also be found hidden in each of the game's levels, are used to unlock other levels. To sum this one up: a primitive interaction with another person playing the game will unlock some content in the game that you could otherwise get by playing the game longer (my, that sounds like a Nintendo variation of a Facebook game!). This new, portable Mario game has been a pleasure, so far. Let's put it this way (trying not to brag but to make a point...), I took a break from my pre-release copy of The Legend of Zeda: Skyward Sword to play some 3D Land this morning. The two games complement each other nicely: both well-made and highly polished, one a game for marathoning, one a game for sprints. I've got an F train to catch. Time for more Mario.